See what it's like to ride in the 2013 Subaru WRX STI Rally car as David Higgins flies by trees at 70 mph on a narrow road as the team wins Stage 12 at STPR. Most of us will never get a chance to drive or ride in the 2013 Subaru WRX STI Rally car, but the Subaru Rally Team put a video camera in the race car to give us an idea of what it’s like. This start-to-finish onboard ride with David Higgins and Craig Drew took place at the Susquehannock Trail Performance Rally (STPR) in Wellsboro, Pennsylvania on June 2. The team won Stage 12 of the 2013 STPR Rally in their Subaru Rally Team USA WRX STI and came back from 21st place to finish on the podium. The video below shows just how precise Higgins had to be as the team pushed extremely hard and averaged over 70 miles per hour on this tree lined stage. The scenery flies by and the WRX STI comes within a few feet of the trees that line the narrow two-lane road. After winning the last two Rally America rounds, Higgins and Drew started this race strong but fell behind after breaking a steering arm on stage 3. The team needed this ultra-fast stage to claw their way back into the race. They broke a steering arm on stage 3 and that left them far behind starting day 2. Using SuperRally rules which allows a team to compete for Championship points after a time penalty, began to claw back into contention after 8 more stages. It was a huge task, but it was stage 12 that put them within 42 seconds from 2nd place. The 2013 Subaru WRX STI put on a show on that stage 12 and came within seconds of catching first place finisher Hoonigan Racing’s Ken Block and second place finishers of David Sterckx and Karen Jankowski. With only one mile remainin the #75 Subaru WRX STI put on a fantastic show for the hundreds of fans at the Tioga County Fairgrounds. Higgins and Drew made an amazing comeback and did manage to make up another 15 seconds to reach the podium with a 3rd place finish. The Subaru team was happy with where they finished considering how far back they were. “Given where they started the day, this is a fantastic result and a testament to the capabilities of the 2013 Subaru WRX STI.” The team ran stage 12 perfectly and they was no margin for error as you will see in the video. The Subaru WRX STI continues to lead the pack in the Rally America National Championship standings. The next event in the series is the New England Forest Rally in Bethel, Maine on July 26-27th. Stay tuned for more exciting Rally America National Championship action. 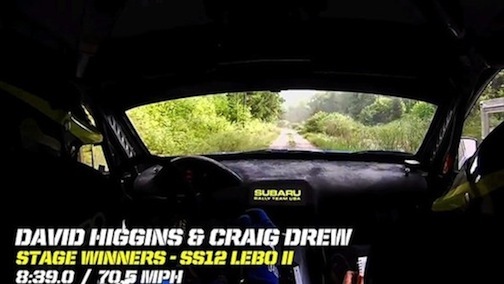 Watch the Full stage onboard with Subaru Rally USA Team #75 Higgins at STPR 2013 video. Will Fans See New Magnetite Gray On Next-Generation Subaru BRZ?